The book listed a number of significant achievements made by companies that had first recognised the distinction between ‘process’ and ‘function’. Hammer and Champy defined a process as a “collection of activities that takes one or more kinds of input and creates an output that is of value to the customer”. They challenged Adam Smith’s methodology of breaking work down into its constituent elements and optimising the way each is carried out – often having each carried out by a specialist in that function. Improving individual activities may not bring overall benefit if it introduces handoffs (i.e. where one person passes information, an order pack, a document requesting an insurance policy, or whatever, to another). This brought raised eyebrows in the Lean community; after all, this same idea was central to Taiichi Ohno’s 7Ws – those of movement, transportation and waiting. Manufacturers adopting the Lean ideas were applying the same principle on the shop floor already. Combining operations at one workbench helped eliminate the need for items to be moved to somewhere else on the shop floor. The movement had the attendant costs of a forklift truck (or whatever) and the potential quality implications of the items being damaged during the movement, which Western manufacturers had always been aware of. The ‘new’ idea was that of management being made more difficult. If items are processed in two separate areas then two areas have to be planned and the items will undoubtedly sit in a queue at the second place of work extending lead times and increasing the value of work in progress. Here were examples of the same approach being taken in many different areas in different sectors. Related to this idea of the ‘one stop shop’ was the concept of carrying out tasks in parallel rather than sequentially. Many business processes had evolved from manual, paperwork-based procedures where a folder, for example, related to a customer order would proceed from one department to another, to another, and so on. Information technology had been introduced that in many cases replicated the previous way of working rather that acting as an enabler for optimised performance. In this example there was now (with suitable IT) no problem with having several departments working on the order simultaneously. Another feature was that of managing by exception – rather than people looking through massive reports on a daily basis, for example, could they simply be given the subset of the items that needed review. Again, recognition dawned within companies making best use of Material Requirements Planning (MRP). That’s what they were doing in looking at ‘exception’ or ‘action’ reports. The book also identified the mechanisms by which processes could be reengineered. It introduced the concept of ‘process owner’ and explored ways by which change programmes could be established. In short, it remains a perfect introduction to the subject and although both authors have been prolific since its publication, with more excellent material in their portfolio, it is still a good investment. 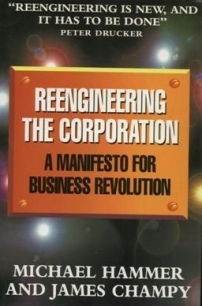 As ever, many companies clutched at the new idea of BPR and launched themselves into reengineering without allocating sufficient management resource or investing properly in the education needed. In organisations that approached BPR as the latest flavour of the month – “we’ve implemented MRPII, we’ve done TQM and now we’ll re-engineer before doing Lean next year” – it failed to deliver the benefits. In fact, in some cases the projects may have been significant factors in the generation of chaos. When we add to this the fact that organisations in the 1990’s used the phrase ‘reengineering’ as a euphemism for their existing plans to outsource product and initiate layoffs, we can understand that, as with all management concepts, BPR has taken criticism down the years. Eliyahu Goldratt, in his book ‘Theory of Constraints’, argues that reengineering is not the best way to focus on a company’s constraint. Is this really the case? The debate could last for ever. The elements of BPR are all common-sense, practical contributors to improvement. Many organisations were successful with these projects and like MLG added BPR as an established and important part of the kitbag of tools to facilitate major changes and then to follow up subsequently and use for incremental improvements. NOTE: One of the MLG team confesses to being a pedant on the subject of spelling and grammar and still finds it difficult to use the word ‘reengineering’ without a hyphen. That is the accepted format, however, so we will conform to the worldwide standard.